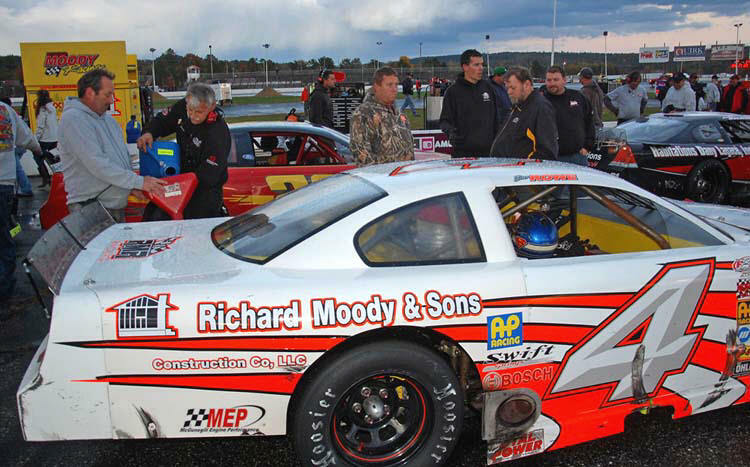 Oftentimes, today, the contemporary race fan is wither too young or has come on the scene too recently to realize that North Country stock car racing has not always been about enclosed haulers, website coverage, and large, modern, bright – lit tracks such as Airborne Speedway, in New York; Thunder Road International Speedbowl, in Vermont; New Hampshire International Speedway; or Beech Ridge Speedway, in Maine. think this type of facility is what racing was always about....... Not ! Especially in that false boom period of the early 1950’s, when race tracks came and went sometimes within a month’s time, racing was begun at old fairgrounds horse tracks and in pastures with carved – out tracks and little infrastructure. 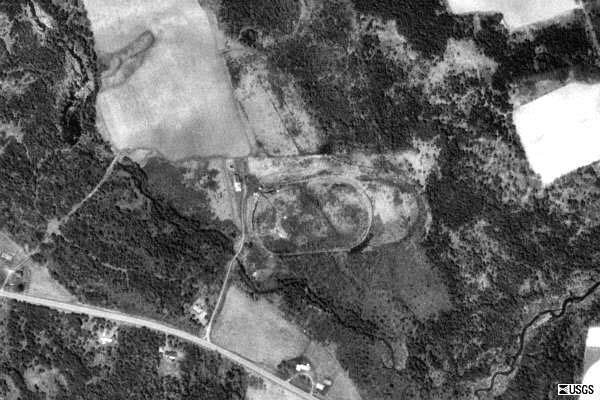 With this in mind, the little – known fairgrounds track near Exeter, Maine would serve as a good example of this situation. 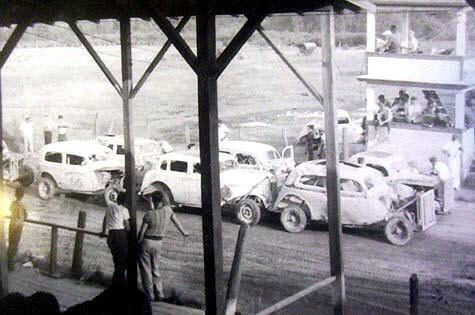 There were many, many stock car venues that had arisen from the taking over of active or dormant local fair horse tracks. Some, like Fairmont Park Motor Speedway near Fair Haven, VT, had little infrastructure left after years of having remained unused. Others, like the Montgomery County fairgrounds in Fonda, NY and the Cheshire County fairgrounds near Keene, NH took good existing facilities and built strong, critically – important racing venues. was almost certainly the first to host a stock car racing event in the state. The little fairgrounds at Exeter were sort in between. The grounds had the typical half – mile dirt horse track that was in generally usuable condition. There still existed some grandstands, and the track even had a judges’ stand of sort [or tower] overlooking the track. So it was that the first owners of Exeter Speedway, did not have to launch into extensive contouring or construction in order to get their shows off the ground. A Town Of Exeter document that is on the internet has supplied almost all of the information I have for this background, although the actual author’s name is not available. 1965. Below – A modest lineup of mostly sedans prepares by the tower in the mid 1950’s. The document states that the original Exeter fairgrounds were established as early as 1967, and that the grandstands and track are nearly that old. The Exeter Fair, itself, never quite recovered from being put in mothballs during World War II and – after a five – year re-opening, it closed for good in 1950. 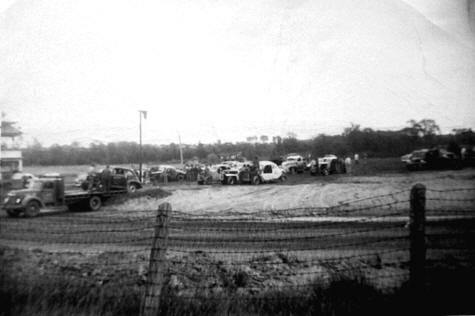 Along came the Exeter Speedway, first in the hands of the Gudroe and Wyman families of Dexter, Maine, who leased the facility for the Exeter Fair Corporation in 1952. This photo shows t hat the Exeter site had decent facilities with which to stage stock car racing shows. ahead of ¾ of its rivals. Below – Harold Pappy Wilcox was one of the early Exeter competitors. During these early years in the 1950’s the track apparently enjoyed at least some periods of success. Some of the top names in early Maine racing are said to have raced at Exeter. 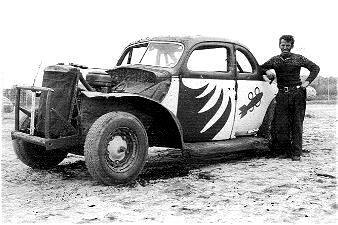 Early photos of stock car lineups on the clay surface show the likes of Maine Hall of Fame driver Manchester, Maine’s Leonard “Blackie “ Hilliard and his unusually – decorated coupe. Harold “Pappy” Wilcox, another Maine hall of famer, also began racing at Exeter in the early ‘50’s, often running against Hilliard and future Oxford Plains regular Si Parlin. Late model star Dana Graves, a fixture at places like Speedway 95, also got his start on the dirt at Exeter. Blackie Hilliard, in the prime of a short but great career in the earliest days of Maine stock car racing, and Dana Graves [Below] in the very beginning of his career, both raced at Exeter, but probably not against each other. In fact, it was the 1967 opening of the modern Speedway 95 in Hermon that put the last nail in the Exeter Speedway coffin. The track had run, off and on, from 1952 to that final year of 1967, going from the original ownership team of the Gudroes and Wymans; through Shirley Brooks of Corinth; and finally with the ownership group of the Wiggin and Bean families - along with Kenneth Buswell of Corinth. The site was used a few times for snowmobile races after 1967, and there a large, 9+ hour rock concert headlining Steppenwolf held on the grounds in 1978; but, the Exeter Fairgrounds was never again the site for stock car racing. Today, the location is still visible, but is rapidly becoming overgrown. 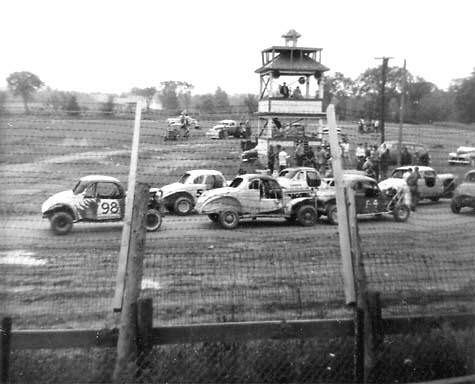 Like so many other forgotten locations all over the North Country, the Exeter Speedway came, served its purpose, and slipped away under the waves of change in the sport. becoming overgrown and hard to find, as seen below in a 2007 view [above].